Every first Saturday of the year, my friends Jim, RAM and I travel down to Baltimore to visit our friend Matt. Once the trip was locked in, the search for a Burger to be Conquested began. 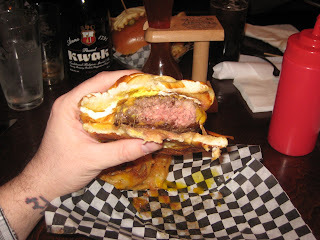 After many web searches, a flip through Hamburger America and even an email to the Burgeratti, I came up with a big fat goose egg. With no dart board in site, I took what appeared to be the top 3 most talked about and asked Matt. 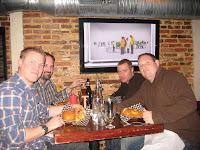 He picked The Abbey Burger Bistro as it was nearest to where we had planned on going out that evening. Located in Baltimore’s Federal Hill section, The Abbey Burger Bistro replaced the Sky Lounge, a hipster laden tango bar that served tapas. I had never been there but sounds like it was a good riddance. 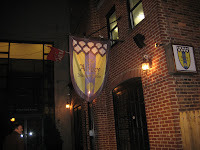 The Abbey is essentially a gastropub located at the end of an alley. The downstairs is relatively small with only about 10 tables, wood tables, floor and bar, exposed brick and flat screen TVs. Are you not the decisive type? Do you freeze up with too many choices? Not too worry. 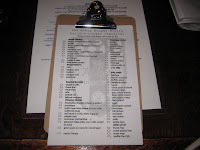 The Abbey offers a straight forward menu with pre-selected burger combos known as “house specialties.” With a delicious half-yard of Belgian Kwak, Not wanting to miss out on the perfect selection I began to peruse my burger options. As my mind ran through the choices all I could picture was a slot machine with spinning wheels. I grabbed the one arm bandit and waited to see which toppings they would stop on. 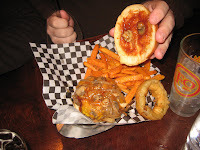 But something kept bringing me back to the first burger on the house’s specialty list: Harry’s Bistro Burger, a beef burger that included bacon, Lincolnshire Cheddar cheese, and a fried egg, sunny side up, on an English muffin with a side of onion rings. 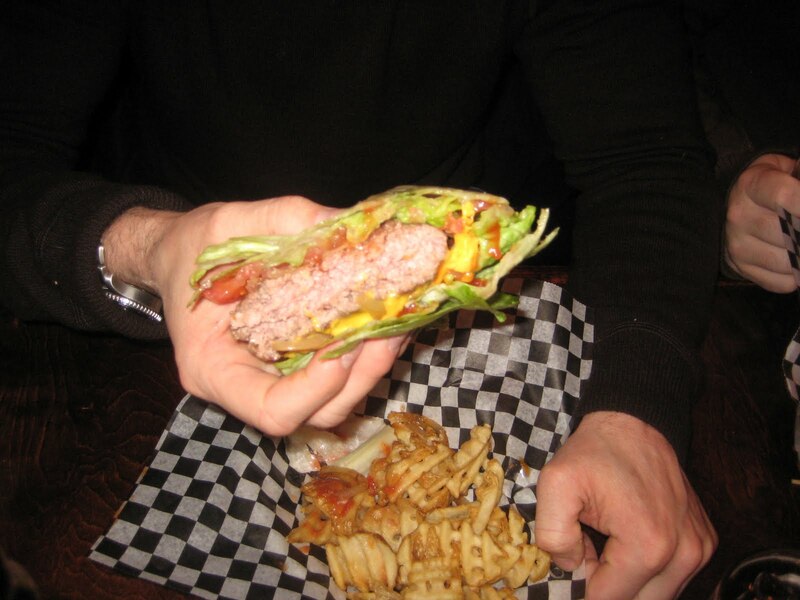 The temptation of burger patties made locally grown Roseda Black Angus beef was too great to avoid. I did however give it my own twist; I replaced the English muffin with a pretzel roll. 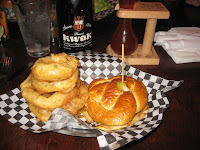 If you have never had a burger on a pretzel roll, you my friend, are missing out. I love me a potato roll and I would be hard pressed to turn down an English muffin but this bread was made for a burger. The name says it all, it’s literally a roll made in the same process as a soft pretzel. It’s warm, buttery and with a hint of sugar. Some might say the flavor is too strong and over powering but when encasing a salty beef patty, sharp cheese and a rich egg, it made for a balance of heavenly creation. Not only did they ask how I wanted my burger cooked (medium-rare) but they also asked how I wanted to the egg prepared (over medium.) I knew I was headed for a righteous treat. The beef was tender, juicy, cooked perfectly and had the exact kind of flavor you want out of a thick pub-style burger like they serve at the Abbey. The yolk burst and started to run down the sandwich. My eyes lit up and I dipped the whole sandwich right into it. Oh man. So good. Every bite was pure dippy egg burger joy. Every one’s personalities really come out in a situation like this. Not a one of us ordered anything like the other. 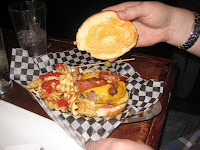 Jim got a lamb burger with bacon, cheese and waffle fries. The RAM got 2 burgers, one wrapped in lettuce, with cheese onions and waffle fries. Matt ordered his with fried onions, mushrooms and a side of sweet potato fries. The best thing about the diversity in side car ordering, we all got to try each of them. The sweet potato fries were the winner in my mind. They were long, crispy and had the great sweet / salty mix you would expect. The onion rings has a lighter batter and were less crunchy than most of their brethren. Rather than relying on grease and breading to give them flavor, the real taste was in the actual batter. I was impressed. 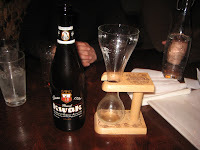 This entry was posted in Bar, Beer, Burgers, Gourmet Burgers, Hamburgers, Maryland and tagged baltimore, bar, best burger, burger blog, burger club, burger conquest, cheese, ciancio, david, Federal Hill, french fries, gourmet burger, great burger, hamburger, maryland, restaurant, rev, review, The Abbey Burger Bistro. Bookmark the permalink. The Lamb burger I had also had cheddar, jalapeno and a chili-chipotle mayo slathered on the bun. My second favorite Lamb burger ever (next to the place in Amsterdam). Oh crap that sounds good. I moved from Federal Hill to Charlotte, NC two years ago. Good riddance is right to the "Sky Lounge". If only The Abbey Burger Bistro had been there before I left. Sounds great. I don't think I can eat all that food. Maybe with other body, because I'm to small and my friends always call me "little ant", so you can get my picture in you mind. I think would be awesome to do that, but I can't do it.